Thunder Tiger 11x4.5 prop replacement? If God is your Co-pilot - swap seats! Has anyone found a good replacement for the TT props? I wish we could get another run made. I would stock up. 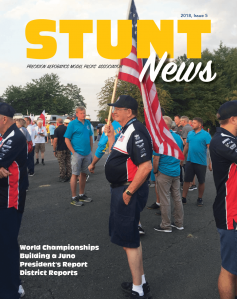 Making America Fly Stunt Again! Re: Thunder Tiger 11x4.5 prop replacement? There were some listed on ebay. Laser-cut, "Ted Fancher Precision-Pro" Hard Point Handle Kits are available again. PM for info. Not a fan of eBay. And he has them priced about right being discontinued. Wish we could find the guy that got the last batch made. I searched but could not find the thread. There is a rumor out there about a carbon version of this prop being developed by Mike Hazel at ZZprops. I spoke with Randy today.....he is out, but is working on more soon. Rick Bollinger was the guy who got TT to make the last batch. Why do you want such illegal copied props by TT and why don't you buy the original props by Yoshioka? The only important thing is the price? We wanted the TT's because they were cheap, worked good, and were available.. So what is the source for "Yoshioka" props ? Have you guys tried the new Master Airscrew GF props? They are much improved and I'll bet the 11-5 would be a good replacement for the TT prop. I recall looking up Yoshioka propellers online some years ago. We have no source for them over here, and IIRC, they're out of production at Yoshioka also. The Thunder Tiger Cyclone propellers were actually made in China. I would wonder if TT even knew they were a knock-off of a Yoshioka propeller. Aki where is the info for the original Yoshioka props ? I don't see any props and not much English. I don't know whether Yoshioka still produce the Glass Nylon Props or not. I haven't contacted with them for some years and they had some stock of the props at that time. You can see their lineup though it is Japanese. Yep I see the props but you can't click on any of them. So looks like they are out of the prop business. Looks like the Yoshioka 11x4.5 prop is listed as part number 207, and priced at 700 Yen (~$6.21). Who knows if they are currently available, though. I think the "Great wizards" of modeling are trying to tell us we're all supposed to be flying "Electric" now just like they told us we were all supposed to be flying R/C back in the 70's. Some of us just never seem to conform to their wishes...wonder why that is! I have reached out to my contact at TT again about more props but as of now have no response. But I am afraid if they agree to make a run of these it will be a substantial amount and I don't want to get stuck with a bunch of these props I mean 100s. I will keep everyone posted on what I hear. Meanwhile, this week brought an email from Mike Hazel, aka "ZZ Prop". My guess is that Mike has not been terribly into the TT 11x4.5 project because he's not using them on his current stunt model (a PSJ profile Corsair with a Saito 40). However, Mike said: "have noted interested on Stunthanger regarding that TT prop again. I should have these in production by January. I actually have the mold cast, but need to do the finish work on it. No time for that right now, but soon. Mike"
Mike just posted over in the classifieds of the other forum that he will be taking orders next month.